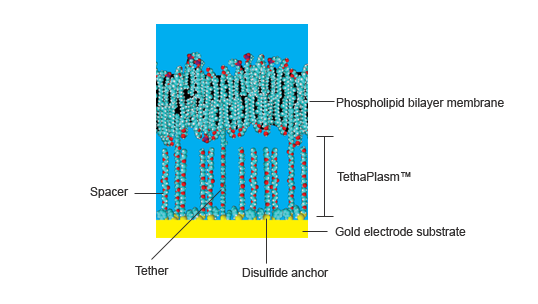 Tethered membranes are planar supported phospholipid bilayers held above a gold electrode by a set of hydrophilic polyethylene glycol (PEG) chains covalently bonded to the gold surface by organic disulfide anchors. A lipophilic alkane phytanyl group is bonded to the top of the PEG chain which acts as a scaffold around which the membrane lipids spontaneously cluster, eventually forming a continuous membrane. The average distance between the tethers and spacers can contain about 9 water molecules, while the height of the membrane above the gold surface is about 2 – 4 nm (depending on the angle the spacer and tether chains make with the gold surface) with about 0.5 nm being occupied by the organodisulfide anchor. Thus the space between the membrane and the gold surface is a mixture of PEG chains, disulfide anchor groups, water molecules, various cations and anions, and small water-soluble molecules. It is collectively known as the tethaPlasm™, and is analogous to the cytoplasm of a living cell. 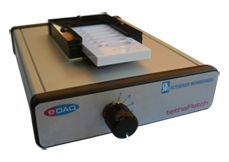 The application of a constant bias voltage can be used to 'charge' the tethaPlasm with an excess of cations or anions, prior to tethaPatch or tehaPod experiments (see below). A tethaPlate™ comprises six chambers each with a gold electrode (surface area 2.1 mm2, 3.0 x 0.7 mm) that has been pre-coated with tether and spacer molecules. Addition of a suitable phospholipid mixture is all that is required to spontaneously form the membrane. A second, uncoated, gold counter electrode sits 0.15 mm above the membrane but does not physically interact with it. Figure 2. Ion channel proteins shown to scale in a tethered membrane. 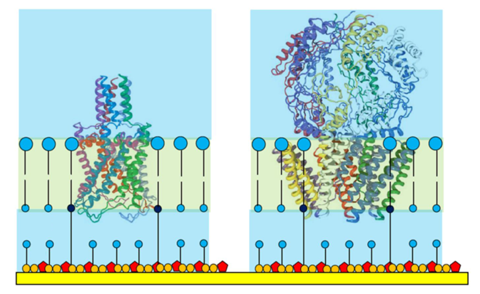 Larger ion channels, such as those shown in Figure 2, often have 'superstructures' that extend into the aqueous solution adjacent to the membrane. Even a moderately sized superstructure cannot be accommodated inside the crowded tethaPlasm forcing the membrane protein to adopt a preferred oriention (as often happens in a living cell). 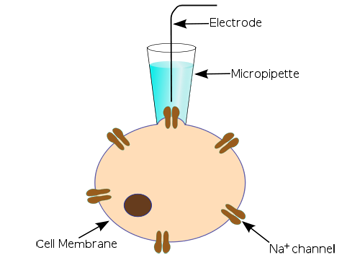 Typically the culture bacteria have the appropriate gene or RNA fragment artificially inserted into them so that they over express the desired ion channel protein. After several days of incubation the bacteria are harvested and the protein components separated and purified (often by gel electrophoresis). Whereas this was cutting edge technology in the 1990's these techniques are now well developed and widely available in proteomics laboratories. Both natural (such as ionomycin and calicimycin), and artificial ionophores such as crown ethers, calixeranes,and cryptands) can also be studied with tethered membrane systems. Ionophores are not always polypeptides and may be quite small molecules, however they must be at least partially lipohilic to ensure they can enter the membrane. 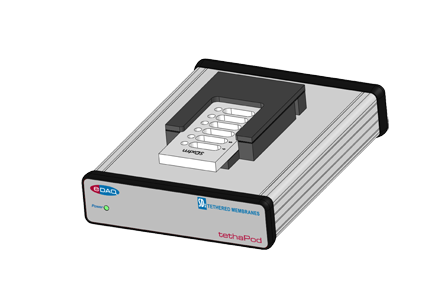 The ER466 Integrated Potentiostat is suitable for use with the tethaPatch for pulse generation and data acquisition of the current signal. Comparative Study of the Bacterial Sodium Channel NaChBac Function using Patch Clamp and A.C. Impedance Spectroscopy in a Tethered Membrane. The protective effect of osmoprotectant TMAO on bacterial mechanosensitive channels of small conductance MscS/MscK under high hydrostatic pressure. Ion Channel Proteins that Spontaneously Insert into Lipid Bilayer Membranes: An Impedance Spectroscopy Study Employing Tethered Membranes. A High-Throughput Technique for Screening Novel Antibacterial Agents Targeting Bacterial Mechanosensitive Channels. Bruce A. Cornell, Andrew R. Battle, Sonia Carne, and Boris Martinac. Biophysical Journal, 102,122a, 2012. Making lipid membranes even tougher. Tethered Bilayer Membranes Containing Ionic Reservoirs: Selectivity and Conductance. Gowri Krishna, Jurgen Schulte, Bruce A. Cornell, Ron J. Pace, and Peter D. Osman. Langmuir, 19, 2294–2305, 2003. Tethered Bilayer Membranes Containing Ionic Reservoirs: The Interfacial Capacitance. Tethered-bilayer lipid membranes as a support for membrane-active peptides. Tethered Lipid Bilayer Membranes: Formation and Ionic Reservoir Characterization.